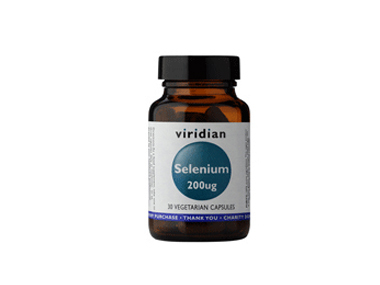 Buy Viridian Selenium 200ug - 30 vegan capsules in the UK from our online shop or directly from our independent Scottish store. Selenium contributes to the maintenance of normal hair and nails, the normal function of the immune system, normal thyroid function and for the protection of cells from oxidative stress. Selenium contributes to the maintenance of normal hair and nails, the normal function of the immune system, normal thyroid function and for the protection of cells from oxidative stress. This 'oxidative stress' appears to be a major factor in many human diseases.Selenium also contributes to normal spermatogenesis (the creation of sperm). This supplement presents selenium in the preferred selenomethione form. Where can you buy real Selenium 200ug - 30 caps safely online? If you are wondering where you can buy Viridian Selenium 200ug - 30 vegan capsules safely online in the UK, then shop with us. Selenium 200ug - 30 caps - Viridian Selenium 200ug - 30 vegan capsules in Minerals A - Z and Vitamins and Minerals.